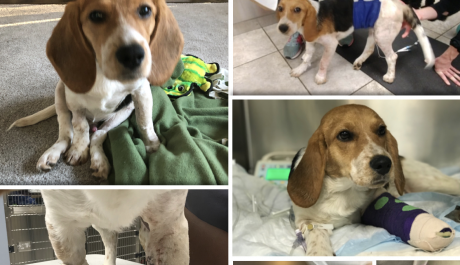 Your donation will help BARNEY (Beagle) recover. Barney's fever finally decided to leave and not come back but not until it drove everyone at the hospital and his surgeon crazy trying to figure out the reason for it. The only thing Dr. Seibert could determine is that he had aspirated a small amount of fluid during his surgery and he had pneumonia because of it. His x-rays showed that he had a small amount of fluid in his lungs but not enough to be concerned about. Another antibiotic was added, and he remained on fluids until they were sure it was not coming back. He has had his final surgery to repair his front leg break and can now settle down and allow the wounds to heal. He is on the strictest cage rest because of his injuries but mostly because his broken pelvis is fragile until the missing area has filled in with bone. He has at least six weeks ahead of healing before he will be allowed to run around and play. With all of the money that has gone into fixing this adorable puppy, you can bet we are not going to let anything happen that would risk damaging any of the repairs we have done. Adorable Barney sure does know how to pull out the sympathy card. All he has to do is roll those Beagle Eyes, and before you know it, you have scooped him out of his kennel, and he is in your lap being loved on. This cute puppy doesn't have to worry about walking because no one will let his feet touch the ground. He appears to be carried everywhere he goes. I think the hospital has taken strict cage rest to mean that Barney should remain in someone's arms at all times. They believe the only time his feet should hit the ground is when he has to use the bathroom and not one second after. Everyone loves a puppy, but a helpless Beagle Puppy is almost impossible to resist. Barney is undoubtedly taking advantage of his misfortune. We have not even come close to raising the funds we need to cover Barney's three surgeries. Please, Donate whatever you can so we are financially able to help other pups like Barney that have been abused or neglected. We are it for these precious Souls. My heart aches for all the dogs in need that no one is stepping up for. I wish we could take them all, but sadly that is not possible.